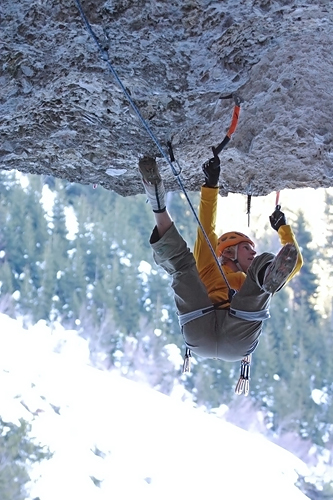 Over the last two years Albert Leichtfried, one of Austria's leading mixed climbers, has almost single handedly developed the mixed-crag Dryland. The result is one of the hardest coldspots in Europe, with 10 routes weighing in from M5 to M13- and plenty of potential for new routes. Located high above Innsbruck, Leichtfried describes the small crag as being special because of "the high amount of ice on every route in good winters. Another nice feature is the hole in the wall, which you easily can walk through and have a warm rest in the sun."